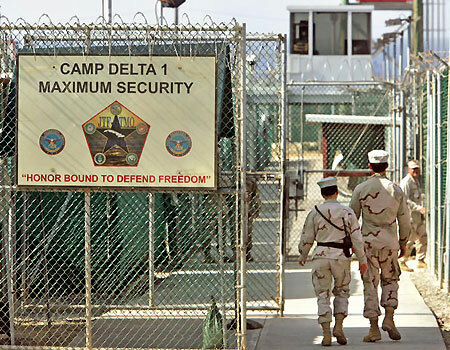 When technologically possible, I’ll be blogging from Guantánamo (below right), where I am attending the arraignment of Abd al-Rahim Hussein Muhammad Abdah al-Nashiri (left), the detainee charged in connection with the deadly 2000 attack on USS Cole in Yemen, among other alleged crimes. I am representing the National Institute for Military Justice. With me are representatives from a number of other NGOs (the usual suspects: Human Rights Watch, Human Rights First, Amnesty International) and members of the domestic and international press, including the indomitable Carol Rosenberg of the Miami Herald, who is tweeting her trip. In addition, several family members of the victims are in attendance. At Thursday’s arraignment, it is expected that Judge & Col. James Pohl will read the charges and specifications to the accused (unless the accused waives the reading) and invite al-Nashiri to enter a plea (see Rule 904 of the Military Commission Rules (RMC)). The arraignment is complete even if al-Nashiri declines to enter a plea. The hearing is important because once arraigned, no additional charges may be referred to that commission for trial without the consent of the accused (see RMC 601). One requesting that commission members be told whether there is a possibility of release if the commission acquits. At the moment, it remains unclear which of these motions—if any—will be heard. Not all of the briefing has been publicly released yet. would harm the public’s interest in a speedy trial. This has proved to be a sadly ironic ruling given the lack of progress on the case. 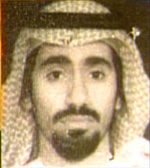 The prosecution objected and eventually withdrew the charges in February 2009. The defense subsequently argued that the withdrawal of charges was improper as it was done in order to prevent al-Nashiri from asserting his rights to a commission. (Note that Judge Pohl's ruling focuses on the public's interest in a speedy trial; the MCA provides for no speedy trial rights for defendants). If al-Nashiri attends Thursday’s hearing, it will be the first time he has been seen by the public since his capture in the United Arab Emirates in 2002. Since that time, he was in CIA custody (apparently in Poland and Thailand) until 2006 when he was transferred to GTMO.